1... create a CD/DVD-ROM ISO Image? 2... create an ISO Image from a CD/DVD/Blu-ray Disc? 3...burn Source Files & Folders directly to CD/DVD-ROM (by-passing ISO Image)? 4... burn an ISO image file to CD/DVD/Blu-ray? 5... edit ISO image file? 6... extract files from an ISO image file? 7... mount ISO file as a virtual drive? 8... automate ISO images burning process? To register the software for use after the evaluation period has ended, click Enter registration key toolbar button, or choose a related command from the Help menu. If you have not purchased your registration key yet, click Buy Now to go to our web site and purchase it online. In the Name field, type in your name and Email address for a Personal License or type your company name for a Corporate License. In the Key field, type in your registration key, or you may copy your registration key and paste it in this field. How to create a CD/DVD-ROM ISO Image file? To create toolbar button, or choose File > Create ISO Image > Create ISO Image command. To import some files and folders to a newly created ISO: click Import ISO image toolbar button, or choose a related command from the menu. Add existing folder to a new ISO image. Select a folder in a file tree where you want data to be added. Click Add File toolbar button or a related command from the Edit menu to add a file or group of files. Click Add Folder toolbar button or a related command from the Edit menu, or press Insert key to add a folder. If you want a new custom folder to be created inside ISO's file tree, click Create new folder toolbar button, or choose a related command from the Edit menu, or from the context menu. Enter the name of the folder and click Create button. 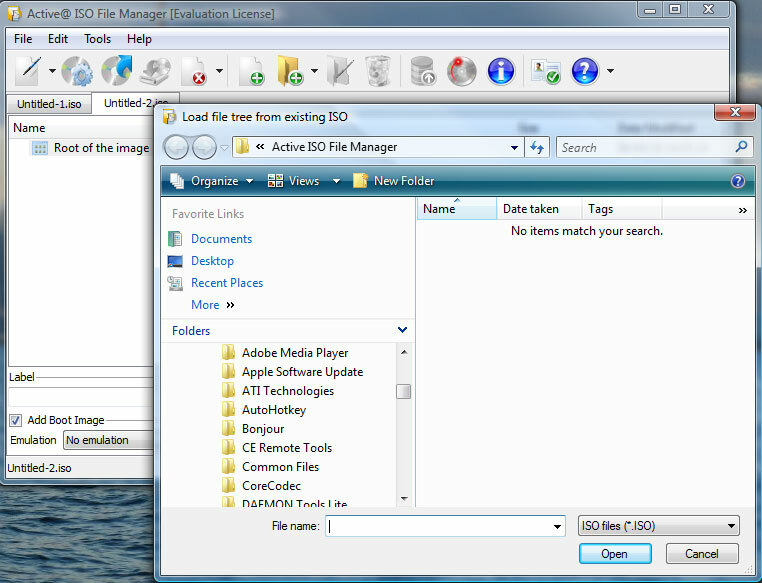 Drag'n'Drop files and folder from the Windows Explorer to the place within ISO's file tree to add them to ISO. At bottom of the working area type a label for the CD/DVD/Blu-ray which will be displayed in Windows Explorer and CD/DVD/Blu-ray drive properties. To make an ISO bootable, click Add Boot Image checkbox and specify emulation type (Floppy 1.2MB, 1.44MB, 2.88MB or HDD) and boot image to be added to boot area. Click the Save ISO image toolbar button, or choose a related command from the File menu, or press Ctrl+S. Choose a name and location for the ISO image file to be created and click Save. Wait while the ISO image being compiled. You can see the progress and click the Cancel button to cancel the ISO image compilation process. How to create an ISO Image from a CD/DVD/Blu-ray Disc? 1. Click Make ISO from CD/DVD/Blu-ray toolbar button, or choose a related Select a source CD/DVD/Blu-ray reader/writer device where you inserted a data CD/DVD/Blu-ray disc. 2. Select a target ISO image file name and path and click. 3. Select a target ISO image file name and path and click Make. 4. Wait while the ISO image being created. You can see the progress and click the Cancel button to cancel the ISO image creation process . Step 1. Make sure that that the Source is Files & Folders in the Create ISO image section. The BURN SRC button should be enabled in this case. Step 2. Specify files and folders to be burned in the Base and Extra areas. See How to create a CD/DVD-ROM ISO Image for more details. Step 3. Specify a Volume Label, File System type, and Bootable options. Step 4. Choose a proper Burner (if you have more than one) and a burning speed to apply. Step 5. Insert a blank CD/DVD-ROM into the CD/DVD-ROM drive and click the BURN SRC button. Step 6. See the progress. To cancel ISO image burning, you can click the STOP button. How to burn an ISO image file to CD/DVD/Blu-ray? Step 2. 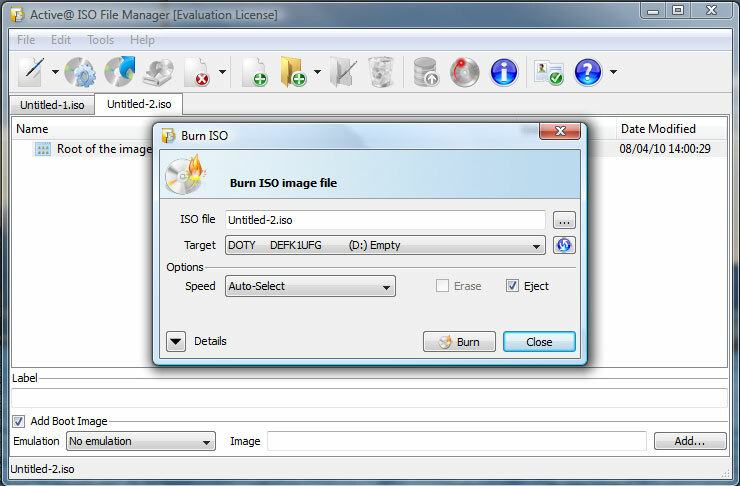 Verify the path to the ISO image file to be burned, or select another ISO image file. Step 3. Choose a proper burning Target (if you have more than one burner), burning speed and other options. How to edit ISO image file? Step 2: Extract files and folders from the ISO image to a temporary folder. Step 3: Click Import ISO image toolbar button, or choose a related command from the menu. This will load file tree from the temporary folder. Step 4: Edit this temporary folder content - add/remove/edit files, folders and subfolders inside. Check and change the Volume Label and select Add Boot Image options if you wish to make an ISO bootable: click Add Boot Image checkbox and specify emulation type (Floppy 1.2MB, 1.44MB, 2.88MB or HDD) and boot image to be added to boot area. Step 5: Save a new CD/DVD-ROM ISO image file based on the contents of the temporary folder. 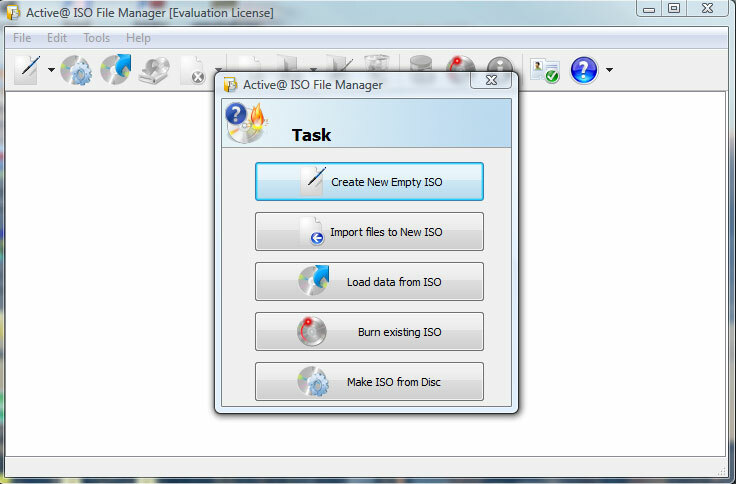 How to extract files from an ISO image file? How to mount ISO file as a virtual drive? Microsoft has produced a small system driver called the Virtual CD-ROM Control Panel for Windows XP, which you can download for free from MS Downloads. Copy VCdRom.sys to your %systemroot%\system32\drivers folder. If the Install Driver button is available, click it. Navigate to the %systemroot%\system32\drivers folder, select VCdRom.sys, and click Open. Click Add Drive to add a drive to the drive list. Ensure that the drive added is not a local drive. If it is, continue to click Add Drive until an unused drive letter is available. Select an unused drive letter from the drive list and click Mount. Navigate to the image file, select it, and click OK. UNC naming conventions should not be used, however mapped network drives should be OK.
How to automate the ISO image burning process. Automation of working with CD/DVD-ROM ISO files ? /ISO-FILE="full path" A full path to the ISO image file to be burned/extracted or created. /IMPORT="full folder path" A full path to a folder to be added to a newly created ISO image (/CREATE-ISO must be specified). All folder's files and subfolders will be added recursively. /EXIT-IF-OK If the command successfully completes, the program auto-exits. If errors are detected - error messages will appear in the dialog screen (no auto-exit).
! Only one command can be executed per run. Stored parameters (Extract/Source folders, file system, boot options, etc..) will be loaded and used for the command execution.